16 x TZ58 1800 30R SunRain Vacuum tube collectors with 4 x 119 gallon SolarStor storage tanks. Complete engineered package for approx. 64 MW of annual heat output. 12 x Tz58 1800 30R SunRain Vacuum tube collectors with 3 x 119 gallon SolarStor storage tanks. Complete engineered package for aprox 48 MW of annual heat output. 8 x Tz58 1800 30R SunRain Vacuum tube collectors with 2 x 119 gallon SolarStor storage tanks. Complete engineered package for aprox 32 MW of annual heat output. Commercial Solar water heating is one of, if not the best investment in your business. It makes sense not just on a financial basis but as great advertising for your business. The systems work more or less exactly the same as residential systems, except they are larger in scale and use a larger storage tank. The list of suitable projects is extensive. We use the PAW Solex DWHX solar pump station with is built in double wall heat exchanger. This system is designed for potable domestic water application and certified to ASME Water standards in North America. 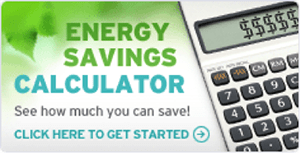 Don't forget there are large tax benefits for installing a solar system! FREE Commercial Solar System Design! If you have a possible commercial solar project you wish to talk to us about, call us now to discuss. We can design the system for you, then depending on where you are in the country we can either install it for you, or refer you to an experienced contractor to install the system for you. Alternatively, we can simply package up the solar equipment you will need and ship it to you. 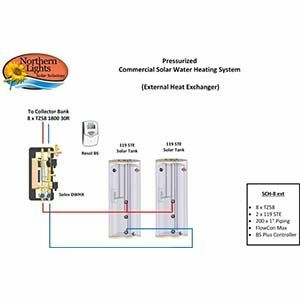 Most solar water heating projects are very simple to install, especially on businesses that ues lots of hot water such as car washes, laundry mats, hotels, restaurants and pools. Someone who knows how to fasten bolts and pipe together could install a system in a solar car wash for themselves. 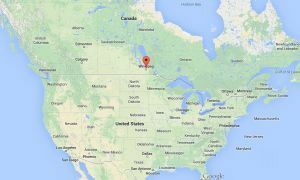 CANADA -The ecoENERGY Incentive program for commercial solar ENDED 1st OCTOBER 2010. All applications had to be in before this date. Now the Canadian election is finished the ecoENERGY grant is likely to be re-introduced, hopefully soon. USA - 30% Federal Tax Incentive to Indiviuals and businesses that install solar thremal heating system on or before Dec 31, 2016. Solar Tax Credits - 50% Accelerated Capital Cost Allowance for Clean Energy Generation. A 50% accelerated CCA is provided under Class 43.2 of Schedule II to the Income Tax Regulations for specified clean energy generation equipment. Eligible equipment includes solar thermal, solar air and solar photo voltaic equipment while project size restrictions have been eliminated. Class 43.2 was introduced in 2005 and is currently available for assets acquired on or after February 23, 2005 and before 2012. A high hot water use makes Laundromats another great candidate for solar water heating. Generally as it gets warm and sunny out we like to treat our cars to a clear bath. Car Washes are a great place for solar water heating as they can provide energy saving of up to 80%. Hotels often have swimming pools and also use a huge amount of hot water for laudry, restaurant and showers. In Ontario many hotels still use electricity to heat water. With the new time of use metering & billing this means you are using electricity at peak rates to heat water for your guests. Why use electricity when you can get free energy from the sun? Breweries, Food processing, steam processes in fact any process that needs hot water or steam, solar can be used to preheat the water. For more information about Commercial Solar Water Heating please visit our main company website. There are case studies, more photos and videos of commercial projects with using Latitude51 Solar commercial water heating systems. 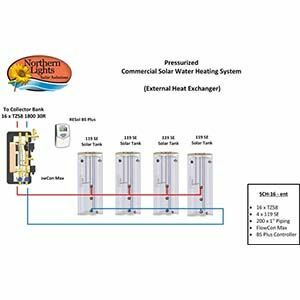 Our Pre-engineered solar commercial water heating systems use PAW Solex DWHX solar pump station with its built in double wall heat exchanger. This unit is ideal for any commercial environment and is certified for potable water applications? 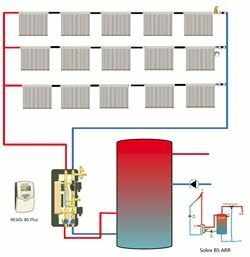 In most commercial solar water heating projects, a large storage tank ranging from 400 to 800 gallons is required depending on the size of the system. We can offer special open loop insulated tanks that are built on site. These tanks have the advantage of lower shipping costs due to their pre fab design and light weight. Our system are priced with or without a solar storage tank as this is an item that can often but found or manufactured locally saving on shipping costs. 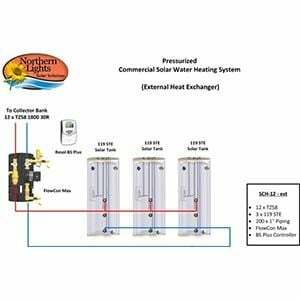 For more information on Commercial Cocoon Water Heaters please visit Large Commercial Solar Tanks. There are two main types of glazed solar water heating collector, evacuated tubes and flat plate collectors. They both work very well, but they both work in very different ways. Which one you use will depend on a number of factors. The links below will take you to articles and info to help you decide which type is best for you. Some of these articles below will open in a separate window. They might take a few seconds to open, please be patient! Solar collector Power output - ie how many BTU's per day. If you only read one of these articles, read this first! It has info that covers most of the other articles below. 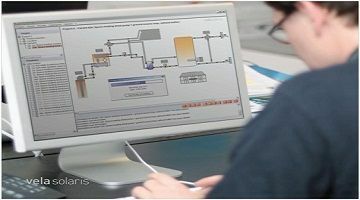 Solar Collector Test Reports - There are many types of collector, all produce different amounts of heat. Where do you live - ie the climate you live in affects the performance of the solar collectors. Solar Collector Peak Power Output - Most collectors have a "Peak Power Output" , this is similar to a car manufacturer reporting "maximum Horse Power. Like cars, this varies a lot, make sure you buy a collector with the highest Peak Power Output. There are many collectors for sale in Canada and our collectors produce about 2.5 times more power then the worst performing ones you can buy. In general if you live in a warm climate then Flat plates collectors work very well. If you live in a cold or cloudy climate evacuated tubes work much better. Evacuated tubes are better in commercial applications as the maximum temperature they can produce is much hotter than flat plates. Our collectors reach a maximum temperatures of 270 Degrees C.
For more information please visit our main company website where you will find more info on Commercial Solar Water Heating.